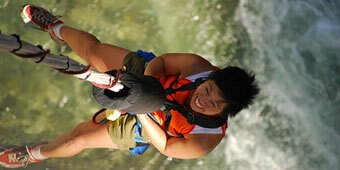 Have you always said that one day you wanted to bungee jump? Or are you a fan and have you just not found the right place to jump straight in in Beijing? There are no more excuses now, as we have lined up three gorgeous places in Beijing where bungee jumps are readily available. It is never too late to try something new or to challenge yourself! Located in Fangshan Shidu Scenic Area halfway up Qilin Mountain, this jump is 48 meters high, and is located above water. There is also a camera to record your jump, so that you will never forget. From the platform, you can see across mountain ranges and streams, all within a beautiful panorama – just don’t forget to jump. Getting There: Take the train from Beijing West Station to Shidu. Alternatively, go to Tianqiao and take bus 917. Located in Huairou County, Qinglong Bungee is located in a scenic area of ravines, ancient pieces of the Great Wall of China, green waters and beautiful waterfalls. It takes three hours to get to the highest spot, and you have to climb parts of the Great Wall to get here. Apart from bungee jumping, there is also the opportunity for other physical activities: free fall, rock climbing, and there is a sand beach by the lake. The drop of this bungee jump is about 50 meters. Getting There: Take bus 916 from Dongzhimen station, or otherwise bus 16 from Dongdaqiao or Xuanwumen. There are also three trains that leave daily from Beijing Railway Station. Longqing’s Bungee is located about 90 km northwest of Beijing’s center, on the edge of a cliff, at 48 meters high. Longqing Gorge Scenic Area is beautiful, and is worth the trip by itself. The bungee jump here was originally designed by the Commission for Science, Technology and Industry for National Defense and is built using the American ADA system. Getting There: Take bus 919 from Deshengmen. I wonder how safe it is to bungee jump in China. I jumped in Yichang and I'm still kicking. They were very professional and the price was okay too.